Two behemoth military ships nearly collided recently as they patrolled the South China Sea — one of the world’s busiest and most contested shipping regions. 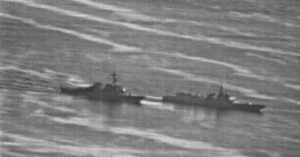 The guided-missile destroyer USS Decatur was performing a “freedom of navigation” operation, when the Chinese Destroyer Lanzhou cut across the path of the U.S. ship, forcing a “radical maneuver” to avoid collision. This is at least the second time in 2018 the U.S. has accused the Chinese navy of acting unprofessionally. As the “increasingly aggressive” military posturing unfolds, Beijing and Washington continue a highly confrontational trade war. 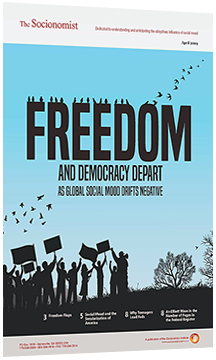 In the April 2016 issue of The Socionomist, Chuck Thompson considers China’s behavior, and the potential for conflict with neighbors and the U.S.